Some 380 evacuated residents of an area west of Pueblo, Colo., were watching fearfully as a wildfire that has already burned at least 12 structures grew quickly overnight. 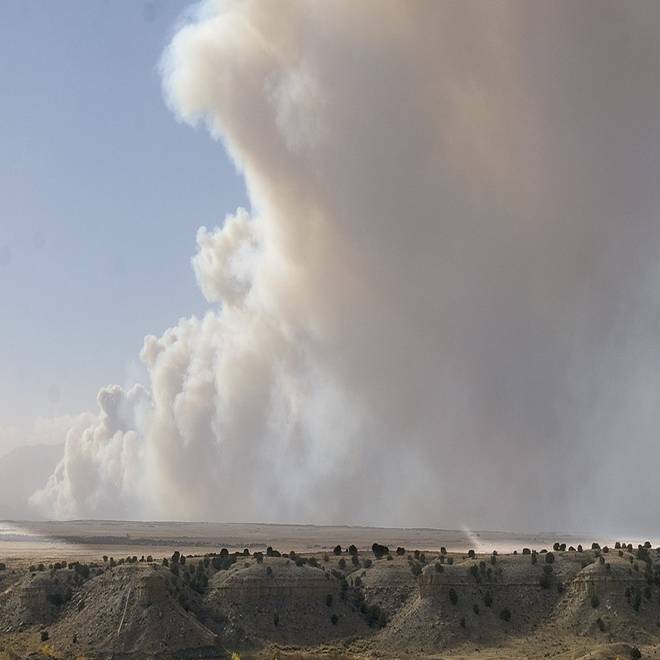 The fire broke out Tuesday afternoon one mile west of Wetmore, Colo., and by Wednesday morning had burned through more than 1,700 acres. Winds Tuesday night topped 50 mph, NBC station KUSA-TV in Denver reported, and the forecast for Wednesday called for continued strong winds. "It's going to be a really challenging day," Steve Segin of the Rocky Mountain Area Coordination Center told KUSA. Smoke billows from a wildfire near Wetmore, Colo., on Tuesday. Windy conditions could undermine plans to deploy aircraft to help firefighters on the ground. On Tuesday, around 100 firefighters were in the area and focused on protecting 25 homes closest to the fire, Pueblo County said in an update. The residents who fled their homes on Tuesday were either staying with friends or family, or at shelters in nearby Florence and Pueblo. The fire is zero percent contained, but officials were hoping rain or even snow might move in Wednesday night. The cause of the fire has not been determined.